I’ve been running the Firefox 4 betas, and I’ve been trying to keep an eye on speed, as that seems to be one of the main reasons cited for switching to Google Chrome by Firefox users I talked to. Now, don’t get me wrong, Chrome is fast, that much is true, but I think what a lot of people forget about is the cruft. For many users, it could be a few years since they’ve done a fresh install of Firefox. I mean fresh as in “starting with a new profile” so that all your old preferences, add-ons, plug-ins, bookmarks, and other bits weren’t there. Right now if you download Google Chrome for the first time, and launch it, there is no cruft. It launches fast. If you’ve been upgrading Firefox over the years and not starting fresh with a new profile… well, there’s cruft. Here’s what I did, and you can try it at home. Create a new user account (if you’re running Mac OS X, just log into the “Guest Account” that wipes itself after every logout) and launch the Firefox 4 beta. For fun launch Google Chome as well. Both will be cruft-free as they won’t have any previous preferences/profile to worry about, and will be starting fresh. In my tests, Firefox 4 launched pretty damn fast. If Chrome launches faster, it’s probably by such a small amount that most people could never tell. 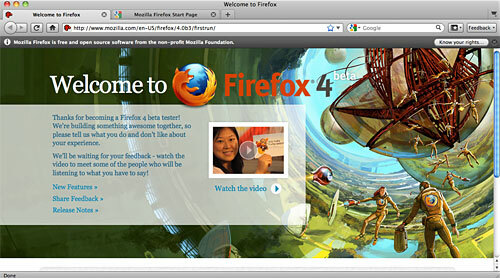 Now jump back and forth between Firefox and Chrome and load various pages. Again, don’t use any magical timers, just experience it, and see if you think they are pretty close. They look pretty close to me. As I’ve mentioned, speed isn’t everything, but it’s nice to see the Mozilla folks stepping up their game and realizing that speed is important to a lot of people. I’ve also read some comments about finding ways to “cleanse” old profile data, to help the folks who have been using the same Firefox profile for years and years, hoping for a bit better performance. Posted on Tuesday, August 17th, 2010 at 6:00 pm. Subscribe to the comments feed. Both comments and pings are currently closed. Post on your own blog. I haven’t tried with the Fx4 betas yet, but on my machine (look ma, no science! ), Firefox takes ~10x as long to load from a cold start. That is with approx the same number of extensions in each browser (I have more in Chrome than in Firefox). I went to disable a few in Firefox to see if it would affect page load time but I would have had to restart my entire browser. With that in mind, I haven’t yet compared the number of plugins, rather than extensions. Phil, there is a definite difference in launch time between Firefox 3 and Firefox 4… and I’m assuming it’s even better if you can start with a “clean” profile as I did. Let me know if you get better results with the Firefox 4 beta. Yep, just in the middle of installing now. Firefox 4 feels much faster so far, although at the expense of legible title text in tabs, which is a bit of a bummer. I went to give some feedback but got “Your comment contains swear words (titles).” ho hum. This is b4. I don’t think it would be fair to use this version until I can read the titles of my open tabs – it would influence me too much, so I’ll wait for another version before passing judgement, but it *does* feel snappier so far. And yes, I’d like titles to be a bit more readable. Either by default (preferred) or via an extension if necessary. I’m glad it feels “snappier” … did you start with a brand new profile, or use your existing profile?